Coleco made some of the most memorable handheld games of the period. 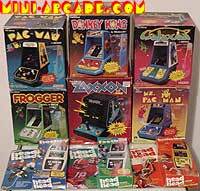 In America during the early 80's, their mini-arcades were the most popular and desirable among boys and girls. They were cleverly designed to emulate the look and feel of real standup arcade games. They especially successful in the market because they were licensed after popular arcade titles like donkey kong, pac-man, frogger, and zaxxon. After all, back then this is what buyers wanted - to feel like they were playing the real thing. With a joystick, marquee art, and side-cabinet art, it was easy to imagine that you were playing your very own standup arcade game. Coleco actually started out in the 1930-40's making leather craft kits for kids, which sold fairly well because they were based on popular leather-wearing icons of the day like Howdy Doody and Davy Crockett. When plastics technology took off in the 60's, they started making plastic above ground pools, and at one time they were the world leader in the manufacture of them. In the early 70's, when the pong craze hit the world, they dove into the video game industry with their own line called the Telstar. It was successful for only a brief period of time, after which they nearly went bankrupt. In an effort to bounce back, they decided to try something different - they went over to Japan and made an exclusive agreement with Nintendo to develop console and handheld versions of their newest stand-up game, Donkey Kong. When the release of Donkey Kong swept the world nearly overnight, Coleco realized that their new and exclusive licensing agreement was a goldmine! So they milked it for all they could. Instead of just developing Donkey Kong for the atari 2600 and intellivision (which was their initial plan), they decided to release their own console instead - the Colecovision. The beauty of this plan was, Donkey Kong was going to be the free 'pack-in' cartridge, and because they had exclusive rights to it, they weren't going to give Atari and Mattel the Donkey Kong software until 6 months after the Colecovision was released! So, in the heat of the DK craze (1982), here was Coleco with the ONLY 2 home versions of Donkey Kong available - one for the colecovision and the other their new tabletop version. This allowed them to make millions upon millions of dollars in just a matter of months. Nicely done! Donkey Kong reigns supreme!